An aerial of 'Harbor Hill', the Clarence Mackay estate designed by McKim, Mead & White between 1899-1905 in Roslyn. Click HERE, HERE and HERE for more on 'Harbor Hill'. Photo from the Aiglon Archives. Katherine left Clarence and her three children to run away with Clarence's doctor, Dr. Joseph Blake in 1910. In 1926, his daughter Ellin married Irving Berlin against her father's wishes and he disinherited her. After marrying Dr. Blake, the former Mrs. Mackay purchased 'Whileaway Cottage', the former William Jay Schieffelin cottage on the George W. Vanderbilt estate at Bar Harbor, from Vanderbilt's widow, and renamed it 'Blake Lodge'. 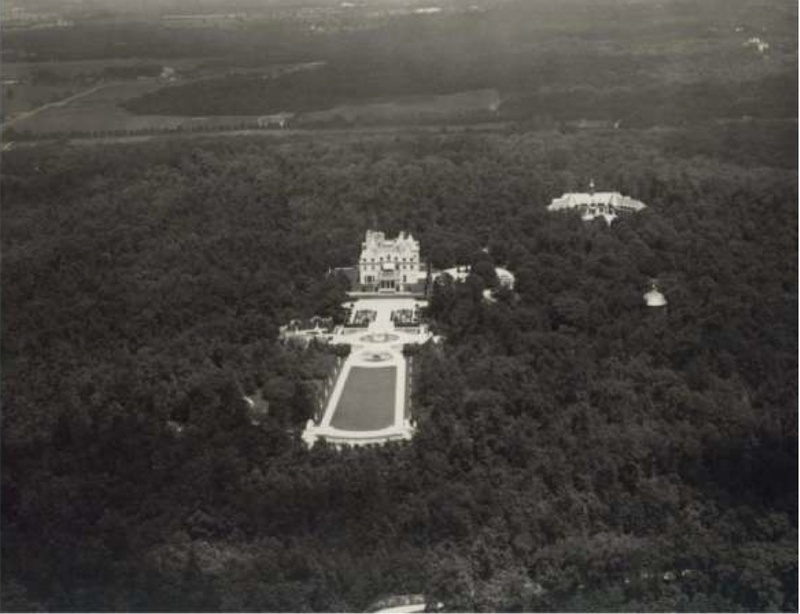 While hardly shabby by summer cottage standards, with 38 rooms spread out over four floors, it was no Harbor Hill, either, nor was L'Oiseau', the Blake country house at Tarrytown. Despite her Old New York bona fides, Mrs. Blake was considered part of the 'fast' set at Bar Harbor, and in his memoirs of his childhood summers there, Louis Auchincloss remembered that, as recently as the late 1920s, his grandparents would not 'receive' her, as she had been divorced, and that thus there was some kerfuffle about him attending a lavish children's birthday party at Blake Lodge. (Auchincloss also remembers being fascinated to know which of her eyes was the false, glass, one. Good info, Ancient. & in 1929 their son, III, would build a much, much smaller & warmer house across the street & name it 'Happy House', which Zach has profiled. All that beautiful, dense and native forest surrounding it ... leaving the mansion for a stroll must've felt like you were in the Adirondacks.